Landing a great work-from-home job can be life-changing. Whether you’re looking to stay home with your kids during the days, bring in a little extra income on the side or put an end to the three-hour, round-trip commute, working from the comfort of your own home can make all the difference in your quality of life. And when that work-from-home job comes with good pay, great benefits or an extra-flexible schedule? That’s just the icing on the cake. These customer service jobs (plus one awesome captioning opportunity!) have a little bit of everything to suit a variety of needs: part-time, full-time, night shift, day shift, awesome benefits and solid pay — these jobs have it all (so that you can, too). If you’ve been looking for an awesome work-from-home opportunity, you’re going to want to read on. Also, be sure to follow our Jobs page on Facebook. We post awesome work-from-home opportunities there all the time! 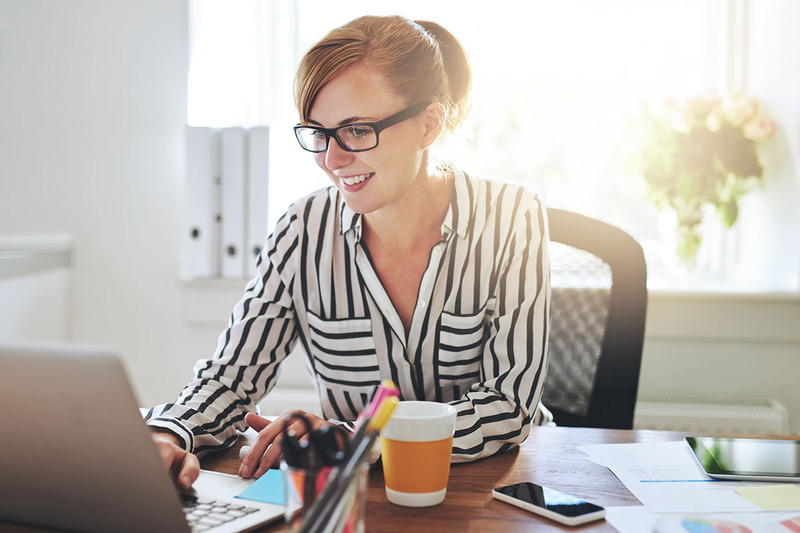 You can check out these six awesome work-from-home job opportunities below! Genesis Digital provides web-based e-commerce solutions for businesses of all sizes. The company is currently looking for a customer success agent to be the first point of contact for its customer base. You’ll resolve customer issues and inquiries via email, live chat and the occasional phone call. You may also assist in various other customer success projects, such as video training with clients, content creation for a “knowledgebase” and the development of better strategies for the customer success team to implement. You should have experience dealing with technical issues, from troubleshooting to resolution, and should have experience navigating the web and mobile apps. You should have excellent written and verbal communication skills and should be able to communicate with customers in an empathetic and professional manner. Benefits include medical benefits, paid holiday and vacation time, a flexible work environment and business training. There is no pay listed for this position, but we’ve reached out to the company and will update this post when we hear back. When you apply, you’ll need to submit a 300-word statement about why you’re right for the job. You can check out more details about how to apply on the original job listing here. 2. Customer Support Representative at Starry, Inc.
Starry, Inc. is a broadband internet provider currently serving the Boston, Massachusetts, area. The company is currently looking for a full-time, overnight customer support representative to work from home. You’ll respond to customer emails, phone calls and live chats to help customers navigate internet and product setup, features and settings. You’ll identify and resolve network and device issues, escalate technical issues to the proper team members and record and track customer concerns and feedback. You should have at least one year of customer service, help desk or technical troubleshooting experience, excellent written and verbal communication skills and strong organizational and analytical abilities. Bonus points if you’re familiar with Zendesk and have a passion for technology. Pay and benefits for this position are not listed, but we’ve reached out to the company and will update this pot when we hear back. This is an overnight support role, so you should be available to work between 11 p.m. and 7 a.m. EST. You must be based in either New York or Massachusetts. Intelenet is a global business process outsourcing platform. The company is currently looking for a part-time customer service benefits administrator to provide support to candidates, retirees, employees and HR contacts regarding benefits. You’ll field incoming calls and emails, identify and resolve problems, improve service delivery and educate callers about various benefit plans. You should have strong verbal and written communication skills, the ability to learn information quickly, the ability to remain cool in high-pressure situations and strong problem solving skills. You should possess a bachelor’s degree and at least one year of relevant work experience or a high school diploma (or GED equivalent) and two years of relevant work experience. Previous experience in a call center or dealing with benefits and HR is a plus. Pay is $14 to $15 per hour depending on experience. Comprehensive benefits including company-paid life insurance and disability insurance kick in after 60 days, and paid time off kicks in after 90 days. Oak Grove Technologies provides learning and training solutions for law enforcement and government agencies, the Armed Forces and health care organizations. The company is currently looking for a real-time captioner to create live closed captions for the U.S. Department of Veterans Affairs, the Veterans Health Administration and the Employee Education System. You’ll provide real-time closed captioning for web-based broadcasting and virtual conferences while maintaining an accuracy rate of at least 98%. You’ll research and confirm spellings, terminology and names and will consult with clients, users, engineers and administrators to identify and implement closed captioning needs across a variety of streaming platforms. You should note that captioning a live broadcast means you will work under intense pressure for long periods of time and will often face high work volume and the inability to plan your workflow. Because of this, you may not have a set schedule, but the listing notes that real-time captioning is needed almost daily on weekdays (except for federal holidays), and you can expect to work on up to five programs per day. Occasional weekend and evening work may be required. You should be familiar with technical standards in streaming media, including web conferencing systems and closed captioning delivery services. You should have prior editing or proofreading experience and a knowledge of internet security standards and different file formats as they relate to closed captioning services. You should have a typing speed of 225 WPM. There is no pay listed for this position, but the benefits include 75% company-paid medical and dental, 100% paid vision, life and disability and a 401(k) plan with a company match. PhishMe offers anti-phishing solutions for companies so that employees can help fight security breaches as they happen. The company is currently looking for a customer support engineer to interact with PhishMe customers, answer questions and resolve queries regarding PhishMe Simulator products, and engage the internal development staff as needed. You should have at least two years of experience in a customer-facing support role, a basic understanding of phishing and the threats it presents, basic technical troubleshooting abilities and a basic knowledge of HTML. You should also have excellent written and verbal communication skills and strong multitasking skills. You should be available to work from 12 p.m. to 9 p.m. PST and should be located on the west coast of the U.S.
Pay is not listed for this position, but benefits include a 401(k) plan with company match and health, dental, vision, disability and life insurance. Romanoff Renovations provides in-home installation for Home Depot and offers various installation and renovation services. The company is currently looking for a part-time customer support representative to field incoming customer calls. You’ll coordinate installation scheduling, inform customers of changes made to their orders or installation schedules, and handle questions, issues and queries from customers as they arise. You should have excellent verbal and written communication skills, strong computer skills and the ability to handle customer complaints and questions in a professional manner. You must be at least 18 years old, located on the west coast of the U.S. and have a dedicated home office space. Prior customer service experience is preferred, as is weekend availability. Previous retail experience at Home Depot is a big plus! Pay is listed between $13 and $15 per hour and benefits include medical, vision and dental insurance, a 401(k) with company match, paid holidays, personal time off and the ability to earn PTO by doing community service.